Checked out Dutch on a weekday, finally. Had the place to ourselves practically, compared to weekends. Was hoping for a better vis, and it was there alright, even though the sky was gray on a 68° day. Surface water temp was almost hot, 74°. Swimming out to the army truck on far side of the lake, saw the Cessna right from the surface. The plane was clearly visible 30’ down below. 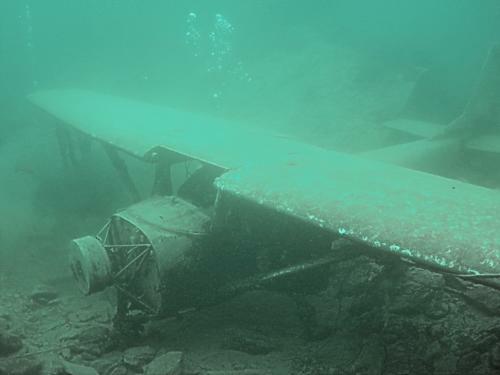 Took some sweet shots of the plane (and bass swimming around) with this kind of vis. Okay, maybe not as good as in that 9/10 Sport Diver article but then again my wide angle is not as wide as the one they use. 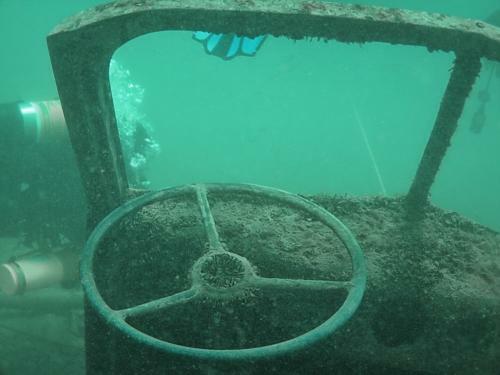 The army truck (“6x6”) is a relatively deep and cold dive, 85’. But 55° down there actually wasn’t bad at all, just a little dark. Zebra mussels covering the dashboard but not the steering wheel – somebody must’ve been driving the truck. Another thing mentioned in that article was the staircase in the East ‘Cove’ described as a ‘stairway to heaven’, time to check it out. 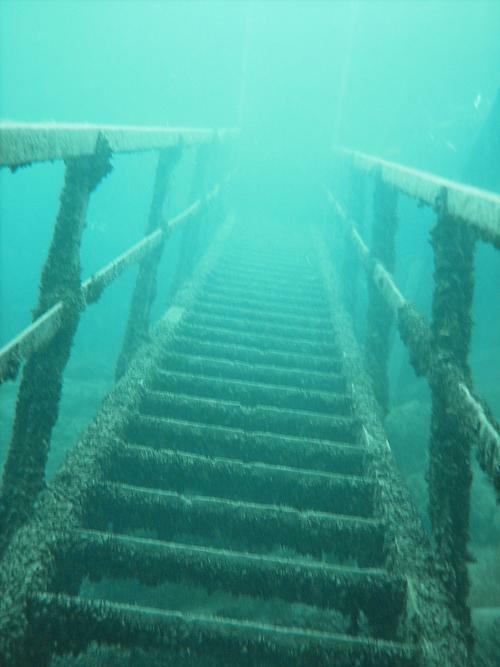 It was definitely cool diving there. Looking at the pictures now, with the end of the stairs disappearing, I guess I see what they meant. And the trees growing around the edges of the cove is an exceptional view from the bottom. A number of blue gill and huge multicolored koi in that area (the first time I saw koi at Dutch). There’s a pump station at 70’, pipes and a large steel framework nearby, it was fun diving through all those X braces of the structure. All of that makes for an exceptional dive, gotta come back there sometime. It’s amazing how much better the viz is there on weekdays when there isn’t a couple hundred divers silting up the place! There used to be "Farmers quarry" in Washington NJ that only took one diver to silt up the place, that’s probably why it’s not open anymore.